The European Union has signed an agreement with Montenegro for border management of migrant flows in the Balkans area. The EU border agency Frontex has signed an agreement with Montenegro for carrying out joint operations in managing migratory peaks and external EU borders. The news was announced by EU Migration Commissioner Dimitris Avramopoulos and Interior Minister of Montenegro Mevludin Nuhodzic. The agreement provides for the presence of Frontex teams in Montenegrin territory. "It's another important step in our cooperation for security," Avramopoulos said. He said Montenegro will remain responsible for protecting its borders, but Frontex can help local authorities, especially in managing peaks in migrant flows. He said Podgorica is "part of the EU family, and this agreement is further proof of that". Nuhodzic said the agreement will contribute to improving security at the borders and the shared fight against illegal immigration. "Today we are further strengthening our cooperation," he said. "We are ensuring a more efficient flight also against transborder crimes," he said, adding that Montenegro "fully shares the EU's security policies". Tuesday's accord is the fifth to be signed between Frontex and a Western Balkans country. Between summer 2018 and the start of 2019, similar agreements were signed with Albania, Macedonia, Serbia, and Bosnia. The only country in the region without such an agreement is Kosovo. 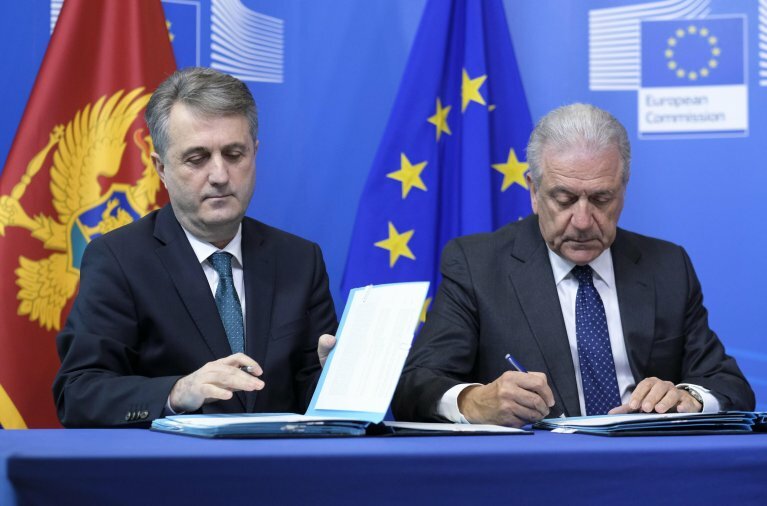 The agreement with Montenegro will now move forward for approval by the European Parliament and will go into effect after Brussels and Podgorica complete the necessary legal procedures.